Abstract. In the present paper analyses concerning on the constituent properties in the eutectoid Zn-Al based alloys obtained by gravitational casting in various moulds and quenching from the two-phase area has been presented. Further presented are the results of microhardness and tribological analyses. Microhardness and tribological tests were performed using an AHOTEC FM-700 machine and a CSM Instruments tribometer. The obtained results were processed statistically. The functions of frequency distributions for properties analysed are presented. Abstract. In recent years, metalic phthalocyanines have received a special attention mainly because they are the starting point in obtaining functionalized materials that are important for many scientific areas such as gas detection sensors, solar cells with dyes, devices for nonlinear optics, pigments with excellent tinctorial properties or fotosensitizers for photodynamic therapy. Some of the metalic phthalocyanines are characterized by the polymorphism phenomena, their crystalline forms presenting different applied characteristics that are sometimes not suited for the desired applications. Copper phthalocyanine is included among these phthalocyanines, characterized by 5 crystalline forms (α, β, γ, δ, ε) with α and β forms showing interest in paint and varnish industry. This paper presents results obtained from the experimental studies of the synthesis and physical-chemical characterization of α-stable crystalline form for copper phthalocyanine, a pigmentary material obtained by means of embedding chloromethylated copper phthalocyanine in raw phthalocyanine, α-unstable form. The resulted materials were characterized by IR and UV-VIS spectrometry, X-ray diffraction, thermogravimetry and solvents resistance. Abstract. Unsaturated polyester resin and jute tissue are combined to obtain a sustainable composite. In the present research paper, some aspects about the thermomechanical properties after immersion in aqueous solution with 5 % NaCl for 3 months at room temperature are presented. Thermo-gravimetric analysis (TGA) and three point bending test were used to study the thermal decomposition behavior and to determinate some aspects concerning the characteristics of this composite. Abstract. In this research paper are presented some aspects about the mechanical properties of green composites after immersion in 5 % NaCl aqueous solution for 3 months at room temperature. Three-point bending test was performed for some aspects concerning the characteristics of the cotton tissue and unsaturated polyester resin composites. Abstract. A particular house built in the second half of the century XVIIIth with a special note in Romanian architecture of this period, has been evaluated in this paper. Now this house is in an advanced damaging situation and needs to be restored urgently. It is an unique architectural house from the south part of Romania region (with wood decoration), and the analysis from this paper had been recorded from detached not useful fragments behind the building, in order to identify the existing materials and to select the proper materials useful for restoration. Microscopy permits one to observe the structure of layers, EDXRF and ICP-AES allow elemental composition of samples and to identify the chemical groups present here. Raman spectrometry method was widely used for investigating the aging of wood from this building. The CIELAB color parameters were calculated and have been determined clarity (L*), red/green colour component (a*) and yellow/blue colour component (b*) and their derived magnititudes: chroma (C*) and tone (H*). The differences between treated and non-treated samples have been calculated, too (ΔH*, ΔC*), correlated with the overall colorimetric difference between treated and not-treated samples: ΔE*. Abstract. This paper refers to coil set defect of very thin stainless steel strips. There are a lot of shape defects, simple or complex. The study and researches are very useful in clarifying the notion, finding the causes and some proposals in order to avoid and correction of the defect. Generally, the waviness of the strips causes a lot of problems for final products which are obtained by stamping and drawing. Difficulties are encountered both in the guiding phase and the cold plastic deformation itself. The precision requirements for semi-finished or finished products have exponentially increased, so the shape defects including coil set became an important research objective. Abstract. 45 km from Bucharest there is an example of Brancoveanu architecture, the Palace of Potlogi. Built in 1698, the first royal residence built in the new style. Exterior and interior decorations of the building are the most interesting parts of the palace, including the decorations, sculptures, galleries, portraits, even the garden and courtyard entrance plane, have some oriental influences. Although simple or torso columns, capitals neo-corintic, fretted railings, doors and windows frames, consoles with original heraldic signs disappeared. Also, some fragments of stucco decoration have been used in abundance with a rare delicacy floral. Even the restoration started some years ago, is almost ready, some analysis have been imposed (from detached not useful fragments behind the building), in order to identify the existing materials and to select the proper materials useful for restoration. Microscopy allows to observe the presence of resin, WDXRF allows elemental composition of sample, while FTIR spectrometry method was widely used for investigating the composition and aging compounds from this building. The CIELAB color parameters were calculated and have been determined clarity (L*), red/green colour component (a*) and yellow/blue colour component (b*) and their derived magnititudes: chroma (C*) and tone (H*). The differences between treated and non-treated samples have been calculated, too (ΔH*, ΔC*), correlated with the overall colorimetric difference between treated and not-treated samples: ΔE*. Abstract. The paper presents the study of the magnetic properties of cold rolled steel strips silicon non-oriented electrical steel. Are shown correlations between the characteristics silicon steel with non-oriented grains, made using least squares, and using regression equations. The experimental group studied was the siliceous strips with non-oriented grains with a thickness of 0.50 mm and a carbon content of between [0.028 to 0.032]% C. Magnetic Loss were determined before and after aging, producing a mathematical modeling in terms of the relationship between magnetic and carbon content Loss of electrical tape analyzed. After determining magnetic losses were obtained regression equations between specific magnetic 1.5T 1.0 T, respectively, before and after aging. For the 0.5 mm laminate strips were obtained very good correlation coefficients. Also they were obtained significant correlation coefficients for magnetic induction values before and after aging. Abstract. This paper is intended to be a study of structural change on nonferrous alloys solidified in rotating electric field. There are shown both the used assembly to generate the rotating electric field and the one for recording cooling curves. Multiple tests were conducted on various alloys compositions of Al-Si, Al-Cu and Zn-Al systems at different frequencies and intensities of the electric field. Assessment of the structure modification degree was achieved through both cooling curves analysis and by optical microscope microstructure analysis. The structural analysis pursued the quantitative determination of phases proportion (constituents) and their dimensions. Abstract. In this paper we are proposing a complex study about the structure and composition of a sample prelevated from Palace of Culture, Iassy (as fragment detached from the building, without value), in order to identify the existing materials and to select the proper materials useful for restoration. Microscopy allows to observe the presence of the main weathering signs (chromatic alteration, alveolization, blistering, differential disaggregation, efflorescence, decohesion, exfoliation and detachment, cracking, delamination, disaggregation, flaking, loss), EDXRF and ICP-AES allow elemental composition of sample, while GC-MS allow us for the first time in the literature, the identification of the coniferous resin from the glue in mixture with fatty acids, plant oils and possibly beeswax used to bind the paint to the wall support. The composition and aging compounds found in this sample have been analyzed by FTIR and Raman spectroscopy. Also, The CIELAB color parameters were calculated and have been determined clarity (L*), red/green colour component (a*) and yellow/blue colour component (b*) and their derived magnititudes: chroma (C*) and tone (H*), together with their differences and the overall colorimetric difference between treated and not-treated samples: ΔE*. Abstract. The main objective of this work was to achieve for steel bars according to EN 10083 C45E, a uniform thickness of the layer of chromium deposited on them, after hard chrome plating process. Chrome plating process was occurred by electrochemical and chromium layer deposited. This deposited on the steel bars, must ensure increased corrosion resistance, low friction coefficient, high hardness and high wear resistance. Also following treatment hardening (HI – hardening by induction using medium frequency, induction currents 3400-10.000Hz at a temperature 9500C) on the bars, were determined hardness HV 01 and HRC. Variation of hardness layer with the depth of it, are shown graphs .We can see that the surface induction hardened material has high hardness, and that decrease as we get it chrome plating layer. Abstract. The stuccoes weathering varies depending on the environment and building materials involved, the basic conditions associated with the deterioration of stucco being: biological growth, blistering, cracking, delaminating, detachment, disaggregation, flaking and loss. For evaluating the damaging mechanism of the stucco,, some models have been created in the laboratory and the effect of high temperature on them have been evaluated. Also, all of them have been analyzed and discussed, based on the analytical investigations (FTIR, XRD and chromatic parameters). The chromatic parameters (L*,a*, b*, C*, H* and E* and their differences) before and after treatment have been correlated with the species generated from gypsum and lime. A comparative study of these parameters and the original color of the stuccoes were carried out. A comparative study of these parameters and the original color of the stuccoes were carried out. Abstract. Constantin D. Stahi (1844-1920) is one of the representative authors of Romanian Modern Art. The paintings selected for the analytical study Tabiet (1901), Books, journals (1906) and Proskomidi (1909) had been examined in VIS, U, VIR radiations and the pigments have been determined by optical microscopy and X-rays Fluorescence spectrophotometry. Degradations of the vernis layer, retouching and other interventions on the painting surface were observed. IR reflectography of the three paintings showed the author’s paint brushing. The paintings showed no preparatory drawings or changes in compositions. Pigments used in all three paintings are ochres (yellow, brown, red), umber, Prussian blue, Lead white and Cinnabar. In paintings Tabiet and Proskomidi was identified, in addition, Cobalt blue, while in Tabiet and Books, journals appears Naples yellow. The research purposes it is to create a database including the painting materials used by the most famous representatives of the Romanian Modern Art. Abstract. Phthalocyanines are among the most studied functional molecular materials with numerous applications in various scientific fields ranging from materials science, catalysis, nanotechnology to medicine. The intrinsic properties of these macrocycles and their molecular distribution can be modified by chemical functionalization. Conjugation of different functional units to phthalocyanine can also enhance the properties of these macrocycles, improving their performances as advanced functional materials. This literature study presents a short review of the current research of phthalocyanine-containing supramolecular materials, focusing on their hetero-arrays with different macrocycles such as porphyrins, subphthalocyanines and fullerene. Abstract. Photovoltaic conversion systems are one of the most interesting technical solutions to the energy supply problem. The purpose of the research performed for this paper is to develop an experimental model of solar cell with an improved efficiency of solar energy conversion using surface micro processing and antireflection coating deposition techniques in order to enhance the optical absorption properties of the material. Comparative analyses have been performed on micro processed and unprocessed solar cells, using optical microscopy techniques; the electrical conversion performances of the cells have been tested and the results have been interpreted. Abstract. The paper aims to explain the properties of polypyrrole to retain some heavy metals from solutions. The objectives were to the following: experimental study of obtaining the nanostructured polypyrrole by chemical polymerization in the presence of Cl-; investigation of nanostructured polypyrrole by UV-Vis and IR spectroscopy, atomic force microscopy; investigation of polypyrrole ability to retain heavy metals from solutions by atomic absorption spectroscopy. The capture of heavy metals in solution, one can derive interesting compounds with photochemical properties where the heavy metals are captured of certain noble metals such as gold. Abstract. This paper presents the study of bioactivity for two compositions of SiO2-CaO-P2O5 glasses by X-ray diffraction analysis. In order to determine the bioactive properties, glass samples were tested by soaking for different times in simulated body fluid. The aim of study was to establish the rate of apatite growth to the surface of the glasses. In order to determine the antimicrobial activity of the samples, a glass doped with silver from the same ternary system was analyzed. The research consisted of testing the antiseptic properties of glass on two reference cultures of bacteria most commonly found in hospital-acquired infections (Staphylococcus aureus and Escherichia coli). It was found that the glass bacteriostatic activity increases with the concentration of silver in its composition. Abstract. This work aims to be a structure study of an eutectic Al-Si aluminum alloy developed from waste and cast into shapes that provide different rates of solidification due to different solidification speeds. For structural analyzes,there were taken samples from a silumin alloy solidified in different casting processes: sand casting ingot form,; permanent mould(chill) casting and pressure die casting. Although the alloy has an eutectic composition, the obtained structures present a hypoeutectic morphology both due to different cooling terms and to their complex composition. Meanwhile, casting process significantly influences both the main phases granulation and sizes and distribution of intermetallic compounds that arise from the complex composition of waste made alloys. Abstract. The paper presents the main features of the system LF-VD used in experimental research, the results of trials conducted in the facility LF-VD with established technology and the results obtained after treatment of steel in a vacuum, given mainly gas content and harmful elements which are small, compared to only steel making electric arc furnace. Abstract. The present work aims to develop a spectrophotometric method for simultaneous estimation of melatonin and Vitamin C in combined dosage form. Absorbance of melatonin and Vitamin C were measured at the absorbance maximum (? max) at 278 and 256 nm, respectively. The coefficient of correlation for melatonin at 278 nm and Vitamin C at 256 nm is 0.9986 and 0.9968, respectively. A linear relation between the absorbance and the melatonin concentration was found in the range 50-80 µg/ml, and a similar one (0-100 µg/ml for Vitamin C). The UV-Vis first derivative spectrophotometry method have been developed in this paper for the quantitative analysis of melatonin and Vitamin C in commercial capsules. Abstract. This paper presents issues related to the use in steel refining of specific computational models used in synthetic slag process. Thus, specific sizes have different views and different parameters that determine the effectiveness of secondary metallurgy operations, based on factors predictable flow patterns. Abstract: The paper aims to present a numerical method used for kinematics analysis of a spatial differential mechanism. The numerical method is based on writing in matrix form of kinematics dependence equations between rigid solids that make up the system. We finally obtain a system of first order differential equations that integrates using numerical integration methods and we obtain the values of kinematics parameters that characterize the mechanism configuration. In the paper is presented only zero-order kinematics analysis that is positional analysis. Abstract. The paper contains a theoretical analysis and a series of experiments on the factors that the performance of the horizontal belt conveyors depend on, as well as experimentally verified suggestions for improving the performance of these machines. Abstract. The vibrations most often leads to undesirable effects such as mechanical failure, costly maintenance of machines, worsening positioning performance of machines tools and also human discomfort. Theoretically, the vibrations can sometimes be eliminated. However, due to the high manufacturing equipment cost that may be involved in eliminating or reduction of vibration, we need a compromise between an acceptable level of vibration and the supplementary manufacturing cost of devices. In this paper have been presented some classical techniques of passive and semi active vibration control in order to reduction the vibration level, the control of natural frequencies through damping modification, using of different isolators and absorbers systems. Abstract. The subject proposed was developed based on a real situation. This paper aims at developing an evaluation method, the calculation of frame-strength steel structures, used in industrial and reinforcing possibilities of these structures. Abstract: The scientific paper will research and consider new solutions MEMS & NEMS for intelligent mechatronics microsystems used for ultraprecise measurement, linear and angular, describing the structural architecture, including hardware and their software. There are realized experimental research laboratory where they are studied metrology and functional parameters, highlighting the quality and intelligent control of the whole industrial process. Abstract. Selective Laser Sintering (SLS) is a rapid prototyping technology useful to provide pieces, assemblies and subassemblies with any geometric complexity, unachievable by other processing methods. The present paper intends to present some aspects regarding the quality of surfaces obtained by this technology. Using methods and techniques of investigation focused on analysis by atomic force microscopy (AFM), the study of two pieces structure made by SLS was realized. These tests have allowed obtaining some qualitative data on porosity as well as some microstructural information of the analyzed areas. Abstract. Ball valves are used in various industrial equipment, often in severe regime determined by the properties of the working fluid, pressure in the system and / or operating temperature. Featured smaller hydrodynamic resistance and reduced installation space has the advantage of ensuring a sealing component fluids containing gas and, at the same time, ensures sealing in accidental fires. This article examines the stages of actuator trunnion ball valves sizing , size optimization of seats for ensuring the normal simultaneously seal and fire safety functions, plus eventual discharge into line overpressure valve body (important requirement for environmental protection). Abstract. The paper presents the study of angular momentum variation in relation to point of reduction. Thus, it is demonstrated the formula with which one can determine the angular momentum of the rigid body relatively to any point of its if we know the angular momentum of the rigid body relatively to a random point. Based on this formula are deduced Koenig's theorem for angular momentum and the mathematical expression of Steiner's theorem. Abstract. The sphere is an undeveloped (unfolded) surface. The surface of the sphere can be developed by approximate methods. This paper presents a parallel calculus between the method of the spherical sector spindles and the method using MATHEMATICA program, for the flat unfold surface of the sphere. The general case is the sphere having radius "r" sectioned by "n" radial sectional plans. The specific case is presented for a three values of sphere radius: r = 25; 50 ; 100 mm and n = 12 radial sectional plans. Abstract. An active control of vibration for a mechanical system involves the introduction an external source to perform its function to reduce vibration and noise level, such as for example, use of hybrid absorbers with controlled force to reduce the influence of seismic waves or wind power on buildings or mechanical structures, noise reduction in the cabin of an aircraft by reducing vibration of the large panels and thin metal forming booth walls; reduction of vibrations level using piezoelectric or electromagnetic devices mounted on the trailing edge of helicopter blades, devices tuning cars, etc. In this paper we are presented main active vibration control techniques currently employed to control of natural frequency in aim to reduce the effects of vibration by changing damping, stiffness or inertia of the system. Abstract. The paper presents the possibilities that offers the use of Matrix of Quality Assurance to provide largest protection against nonconformities in the manufacturing process. Are presented the two indicators that highlight the level of protection provided: the overall quality of workplace (preventing the passage of nonconforming product downstream) and the overall quality of the factory (preventing irregular delivery of final products outside plant). So, the matrix allows assessing the level of protection (against non-quality) of a internal customer and external customer. But it highlights a shortcoming in the calculation of the two global indicators: no differentiation is made between failures according to their gravity. To take this into account and in this way to have a more realistic appreciation of the protection of the customer, it is proposed to weighting these indicators: new relationships take into account the gravity weight faults. Abstract. The scientific paper treats the new concepts on engineering education in intelligent specialized field of Adaptative Adaptronics regarding their integration into advanced research and development activities of new professional skills for the future. Also, the concepts are treated the concepts of tele-monitoring, tele-service, tele-configuration, tele-maintenance and integrated tele-control. Abstract. Finite Element Analysis is accepted in international standards, as an alternative method of designing pressure vessels (including valves). Valves are frequently subject to repeated mechanical and thermal load. When the maximum load varies between yield load and plastic collapse load the valves body can deforms plastically. What happens depends on the load and geometry. Is necessary to integrate FEA into a design cycle as part for safety, quality, reliability and cost effectiveness improvements . This article gives methodology of ball valve design by using CAD design and FEA verification at maximum loading pressure. The main purpose is structural analysis to be carried out of determining stress and strains developed in the valve body and other elements. Abstract.The scientific paper deals with trends in development of intelligent mechatronic equipments with applications in automotive industry. Also, the scientific paper deals with aspects related to the concepts of approach in design of main modules constituting the intelligent mechatronic equipments, being presented a wide range of the achievement intelligent mechatronic equipments. Abstract.The biggest problem of intelligent measurement and integrated control is the need to ensure the quality of the product and the manufacturing process, regardless of the field, or intelligent industrial processes. In the development of high-tech intelligent techniques and technologies, with increasing demands for quality have been designed and developed, different mechatronic systems for intelligent integrated dimensional control, nationally and internationally accepted. Thus, new techniques and technologies and new systems for dimensional control who integrating the new requirements of the developments, were realized and developed by specialized companies. The creactivity of human being and his correlation with the requirements of permanent increase of the living standard, constitutes the basis of developments in moderns society. In a perfect world or in an perfect integrant production environment, the tridimensional measurement systems, who provide the quality and the integrated control in the production line, would be able to measure all the necessary parameters in a single step, with no errors and to send the results to the manufacturing networks with computers, in useful formats for CNC equipments. 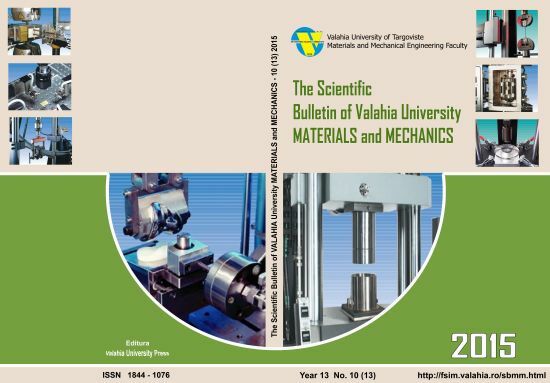 Abstract.The paper contains a theoretical analysis and a series of experiments on the factors that the performance of the slant belt conveyors depend on, as well as experimentally verified suggestions for improving the performance of these machines. Abstract.The paper presents a method of deduction of the kinetic energy computing relationship for the rigid solid in general motion and from this is deduced the mathematical relation of the Koenig’s theorem for kinetic energy. Further on, is presented a demonstration of the Steiner’s theorem which is based on the mathematical expression of Koenig’s theorem in case of kinetic energy. Abstract.Cellular manipulation and single cell manipulation especially, created a strong focalization of biomedical researching world around of this direction. Today we can find out a great diversity of manipulation methods, but our researching collective conceived an innovative one, that involved a special designing session for obtaining an optimal enclosure. The manufacturing process needs a simple, robust and economical technology. In this work we present a technical solution that includes all remembered attributes. Finally we present the experimental model achieved following the concept idea. Abstract.This paper is presenting a technical solution to produce and use oxy-hydrogen (HHO) as a fuel supplement. Using appropriate equipment, oxy-hydrogen is produced by water electrolysis and immediately transmitted to the engine. The introduction of hydrogen into the combustion chamber increases the efficiency of the combustion process and, therefore, reduces the fuel consumption and the polluting emissions, increasing the power and performance of the engine. Abstract.The subject proposed was developed over two parts. In the first written work it was presented the initial situation within a production flow that is sensed in the appearance of defects and nonconformities in obtain the final products. In this second paper - respectively this - we will show the use of this method in a situation that requires elimination of a technological problem appeared in the production flux and in relieving its positive consequence. Abstract.The working of friction couplings in case of small sliding velocities and in case of a mixed or limit lubrication comes along with an unevenness of motion characterized by abruptness or by fits and starts. This phenomenon is known as stick-slip. The occurrence of this phenomenon in numerous technical applications has always aroused an increased scientific interest because of its unwanted implications on the machining precision in machine-tools and not only. The present paper proposes an analysis on the influence of different parameters that may come between the couplings working where stick-slip occurs. Abstract.MIMICS come from: Materialise Interactive Medical Image Control System (is an image-processing package that interfaces between 2D image data (CT, MRI, Technical scanner,...) and 3D engineering applications. Applications include: anatomical measurements, 3D analysis, Finite Element Analysis (FEA), patient-specific implant or device design, additive manufacturing (also called rapid prototyping or 3D printing) and surgical planning or simulation. By using image segmentation in Mimics, users can select a specific region of interest from the collected medical data and have the results calculated into an accurate 3D surface model. Additional modules are available for Mimics that provide an interface with different applications. This means that Mimics can easily be adapted to the needs of users.